VisionLink has completed another review of our compliance with the Alliance for Information and Referral Systems (AIRS) standards, version 6.0. We are pleased to report that we are just so slightly shy of the 100% benchmark. We'll have the last bit taken care of very soon. We strongly endorse operational, technical, and data exchange standards as each increases the efficacy with which information and referral organizations can connect needs and assets across communities and states. Certainly, every community and region has it's own particular needs, but a standards-based approach provides a tested foundation, a starting point, from which local areas can build and enhance their solutions. We were in fact the first to support the AIRS XML Resource Data Exchange standard, the first to support all six levels of the AIRS taxonomy, and we also support the auto-update protocols for the taxonomy itself. If you would like to learn more about AIRS, you can visit their home page, learn about member benefits, or explore version 6.0 of their overall standards. When disaster strikes, trying to find out how your friends and family are doing can be agonizing. Not knowing is an awful feeling. 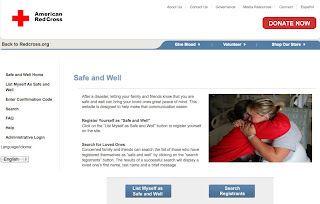 To meet this need, the American Red Cross offers Safe & Well. Those who are hit by a disaster large or small can register on the Safe & Well site, and then their friends and family can search the database and receive information about a loved one's most recent status. VisionLink is proud to provide this solution across the United States for the Red Cross, and we remind our 2-1-1, elder care, homeless management, crisis call centers and other customers that they may want to embed a link to the Safe & Well site, as preparation for future disasters. We have launched a new page on our website which you can find here supporting the national call for 2-1-1 legislation. Quick summary information, and a really easy tool offered by the United Way to contact your representative are waiting for you. All you need is your Zip Code to get started. Great momentum is building behind this effort to help make 2-1-1 available and sustainable across the United States. Particularly in this economy, efforts to better coordinate limited resources are truly necessary. If you've not made your voice heard, start today--right now. It will take 2 minutes.